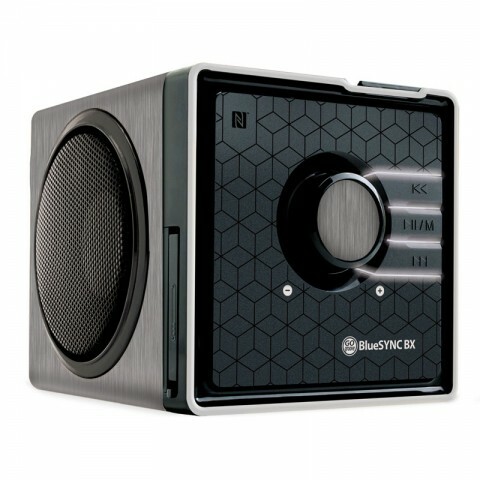 Portable, compact and modern, the BlueSYNC BX Bluetooth wireless speaker is perfect for streaming music. Tap to pair using the NFC technology, connect through Bluetooth or play music through the flash drive input. Designed with a sleek silver metal design, this speaker will turn heads wherever you are! 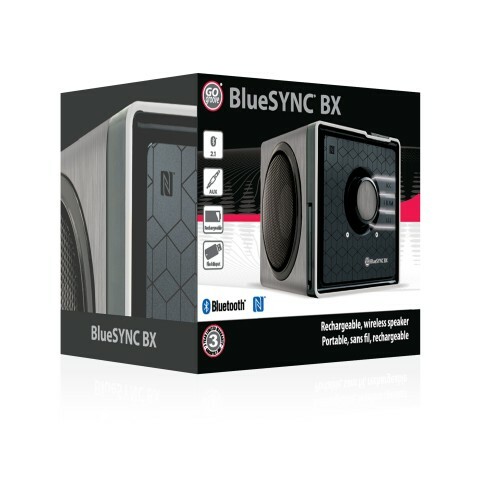 The BlueSYNC BX portable speaker is built to be the perfect accessory for any situation. Sleek silver coloring and a metallic shiny body give the speaker an industrial yet classy look. It's accented with a glossy black face with a subtle geometric design for a textured feel. Backlit LED lights make seeing the onboard controls easier as well as a premium look. 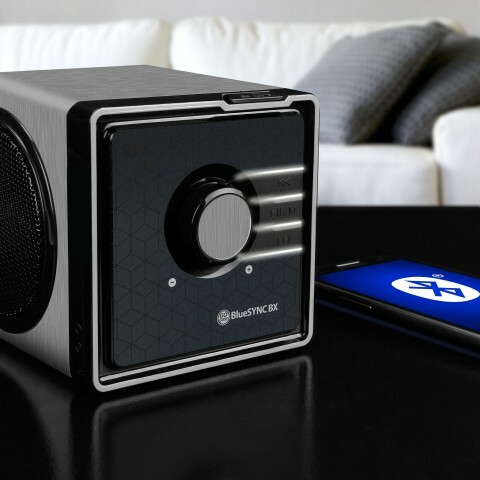 The cube shape gives you the option of setting the speaker up however you feel works. 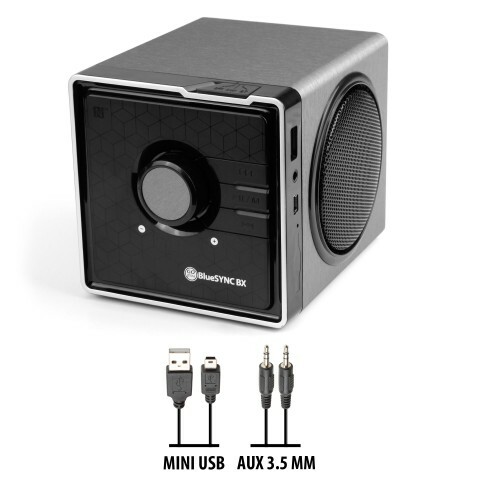 Small and compact, about the size of a softball makes it portable and easy to take on the go! Equipped with both wireless Bluetooth and NFC capabilities, pair any smartphone or tablet to enjoy premium audio up to 33 feet away. There are no limitations of wires here! Bluetooth v2.1 +EDR gives you CD quality sound that is crisp and clear every time. Use the NFC feature to eliminate the pairing process with "tap-to-pair" connection with supported devices. Simply touch your phone to the N-logo on the front face of the speaker to pair effortlessly. With NFC technology you no longer need to pair your GOgroove Bluetooth device with your phone or tablet every time you want to use it. After a one time introduction, simply touch your NFC capable tablet or smartphone to your device and you are good to GO, and groove! 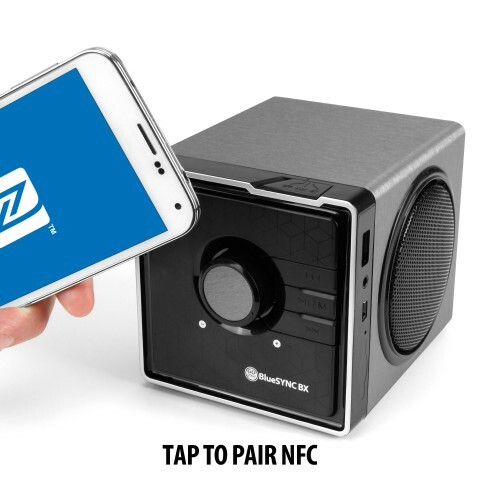 NFC is a simple and fun way to pair instantly! 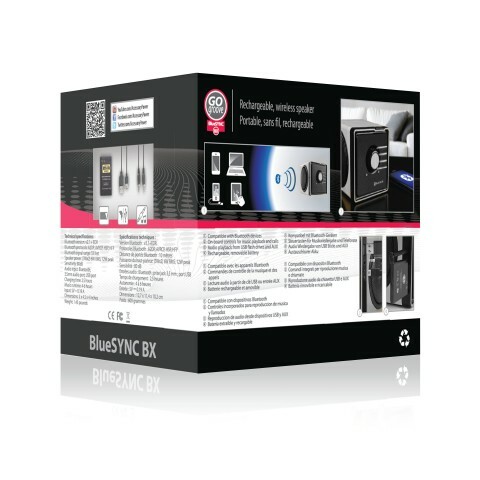 Not only does the BlueSYNC BX allow you to pair bluetooth devices, but also gives you the option of playing music through the 3.5mm AUX or the USB flash port. Use the included 3.5mm cable to play audio off any device with a 3.5mm headphone jack. 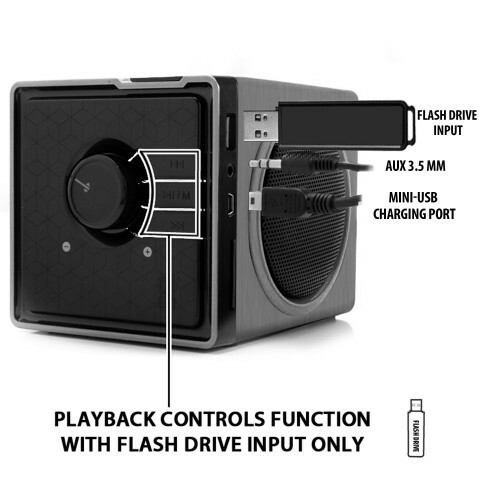 Also use the USB port to play music off a portable flash drive unit. 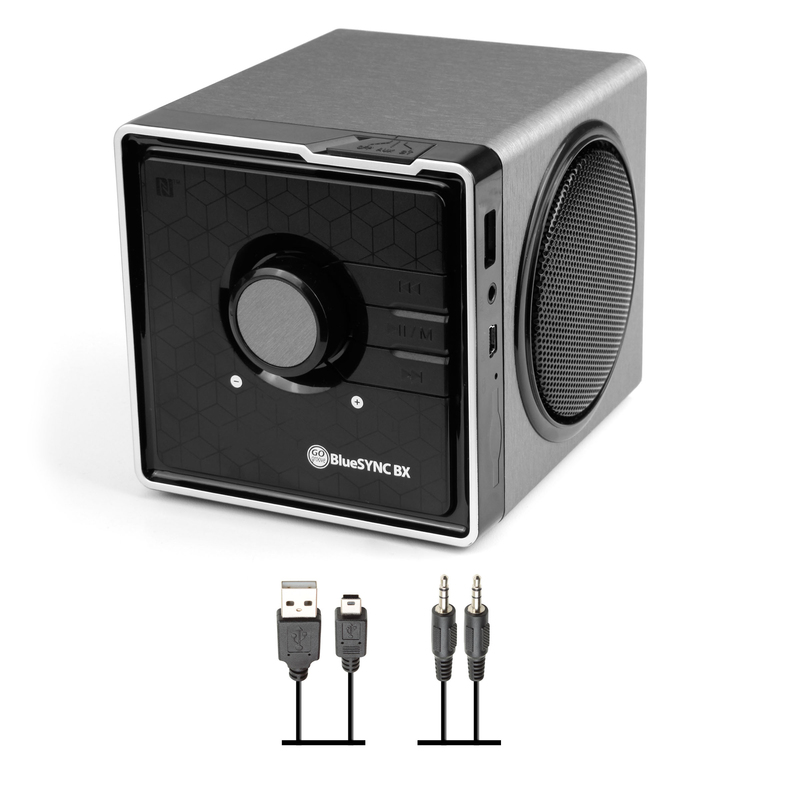 We don't settle on one audio input and neither should you! The 50mm drivers with 12W PEAK power, delivers room filling, quality sound without the bulk of a boom box or stereo set-up. The 2 large side-firing drivers are ideal for providing loud stereo sound. 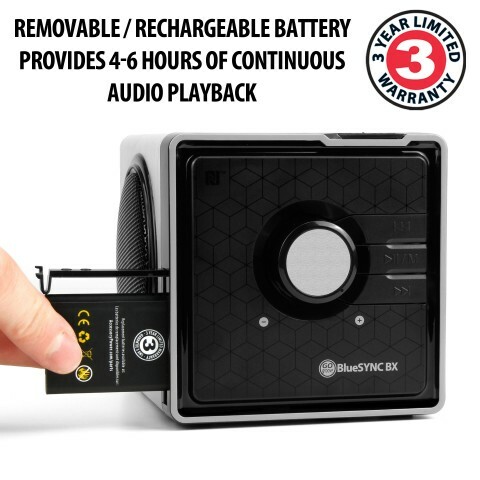 The rechargeable, removable battery provides up to 6 hours. The removable battery allows you to swap extra batteries on the fly (sold separately). 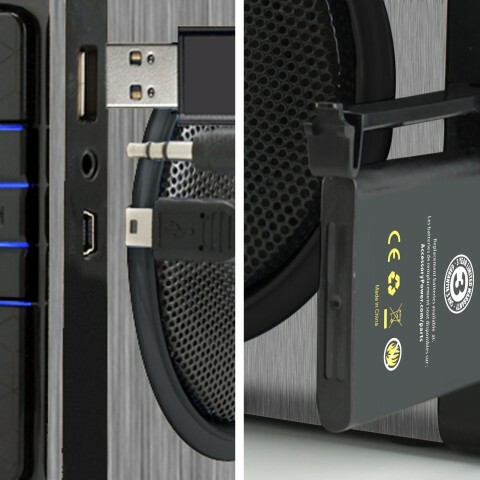 When the party is over, charge the battery with the included USB cable from your PC or smartphone charger. 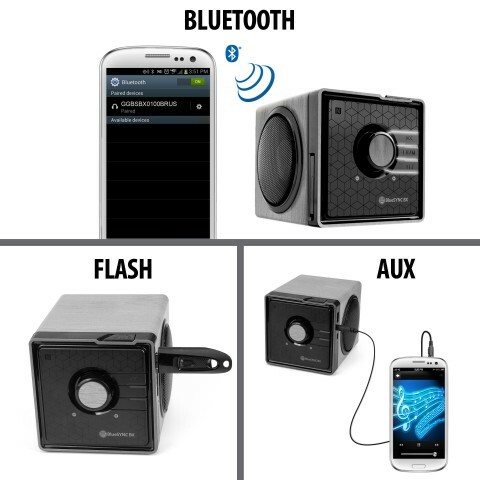 The speaker has onboard control buttons allowing you to control playback for Bluetooth and Flash audio. Play, pause, fast forward and rewind your music. 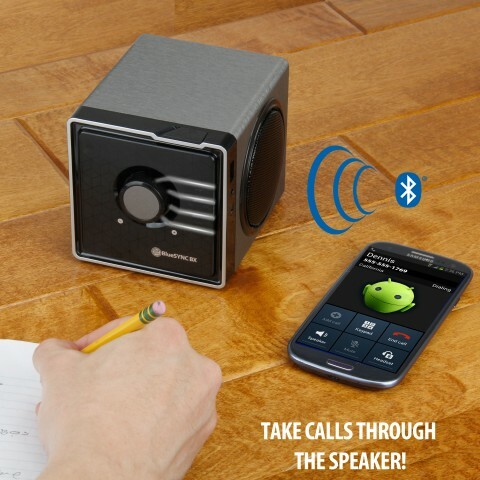 You can also answer phone calls through the integrated microphone turning the speaker into a wireless speakerphone.